This week starts with serious reflection. The Moon enters Capricorn for the second time in this lunar cycle, which began at the Capricorn New Moon* on December 21. Now, the Capricorn Moon is an “old moon,” which is a much different beast. At the New Moon, a new season and a new year had just begun. Capricorn inspired our resolutions and pledges for the future. At the beginning of a cycle, Capricorn uses its genius to assess, set goals, and begin the determined march up the mountain. Capricorn at the end of a cycle carries a different energy. Saturn rules Capricorn. This planet is the Elder who imparts wisdom from the vantage point of experience. Saturn and Capricorn both represent the accumulation of wisdom that is gained from the school of hard knocks. We are that stage of the Capricorn cycle. This doesn’t mean we are completely banged-up and bloodied by events from this lunar cycle, but we’ve been through a bit and it is time to look with the long-view again to what we have learned. If wisdom were nectar distilled from strong effort, then what is the power of that precious liquid? This period of reflection lasts only briefly, then the momentum of the next lunar cycle takes over. The signs and seasons build on each other. Capricorn gives a foundation for the Aquarius mission. Just as Aquarius sets the stage for Pisces at the end of winter’s season (in the Northern Hemisphere). Aquarius is a visionary sign. Aquarius, so focused on the problems of the present and the possibilities of the future, often doesn’t have much time for the past. Capricorn’s lessons can be overlooked, and that would be a mistake. Every lunar cycle is an opportunity to set and follow intention. Through this practice, we can change ourselves and change the world. No sign is more eager to change the world than Aquarius. Each lunar cycle is also a chance to lay down a pattern within ourselves that helps us in our journey through the seasons of life. Capricorn’s cycle has laid a pattern within our bones. This primal pattern of aspiration and the wisdom gained from following the call helps us to lay down the Aquarius pattern of dreaming the impossible into being. Capricorn tells us that we get what we work for; nothing is just given to us. Even our struggles and set backs become the precious nectar of wisdom. Learning to appreciate my struggles opens the way for a future of daring innovation, a world of freedom and truth. Sunday, January 18. Acknowledge the obstacles you’ve encountered this lunar cycle. Honor the pledges you made and the determination you’ve displayed, even if you have already fallen off that particular path. These experiences have given us wisdom. Today’s favorable aspects between the Moon, Mars, and Neptune allow us to sense into the bigger truth beyond our minor successes and failures. Notice how it feels to live as though the journey is more important than the destination. Notice how it feels to be part of a bigger story, one where you are connected to the hopes and dreams of many others. Monday, January 19. Martin Luther King Day. Today’s aspects create a potential for dramatic expression of feelings. Inspiration expands when we sense into collective beingness. Idealism motivates our actions. The desire to speak with one voice to a future we envision is strong. Venus in visionary Aquarius opposes Jupiter in creative Leo. Love is the guide to new worlds. If anything, the caution today is that we may be too enamored with our visions for a new world. But sometimes, it can be a good thing to put aside caution. Mars conjoins Neptune in Pisces further removing the boundaries that keep us separate. Sometimes, it can be good thing to let boundaries blur. That way, we learn to really feel with another what they are feeling. Empathy is created. On top of these transits, the Moon in Capricorn triggers the paradigm-changing square of Pluto and Uranus. Many people all over the world want change, and they want it now. 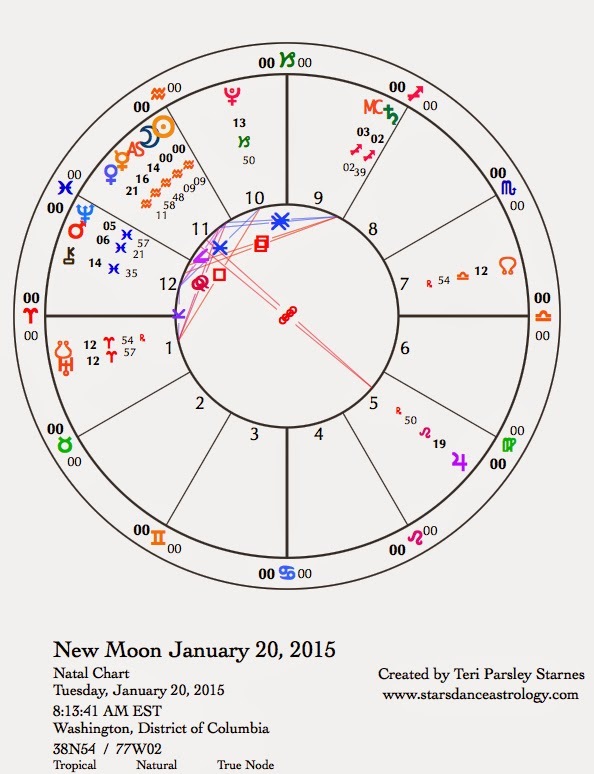 January 20—New Moon: Dreaming. Once again, the lunar cycle begins at zero degrees of a sign. (This also happened in the Sagittarius and Capricorn cycles.) This time the New Moon is at zero Aquarius, a potent degree for a sign that is so much about the future. Zeros mean the slate is clean. Zeros say anything is possible, and that energy fits perfectly with Aquarius. Archetypes resonant with Aquarius are the scientist, the revolutionary, the visionary, and the coder and decoder of patterns. As Fixed Air, this sign loves the rarified atmosphere of space. Sometimes Aquarius can be too detached or too abstract, but often Aquarius can be brilliant, especially if we can sprinkle in a bit of empathy and humility. As we progress through the month we’ll have the opportunity to cultivate a balance between intellect and emotion. Mars, Neptune, and Chiron in Pisces bring the heart into futuristic vision. These Pisces planets will be challenged by Saturn in Sagittarius to manifest concrete practices around what we are feeling. There’s a temptation to lose track of the vision when we are immersed in emotion. Saturn is asking for a more strenuous investigation of what we are feeling. The questions to ask ourselves when overcome with emotion, and this could be positive emotions too, are: Where does this feeling come from? Does this emotion blur boundaries and create confusion? Am I confusing a feeling (Pisces) with a truth (Sagittarius)? Discernment helps us to look past the first response to notice root causes. Aquarius is co-ruled by Saturn and Uranus. These planets show us how Aquarian visions are being manifested currently. Saturn in Sagittarius asks for discernment about what is foreign to us; has us creating revolution through assessment of values, especially religious ones; and wants us to be more disciplined about freedom. Ideals aren’t enough. Uranus in Aries adds the fire quality of impatience to the revolution. Uranus has been in Aries since 2011. Change is speeding up. This lunar cycle may feel like someone just engaged the hyper drive on this space ship of ours. A constant drumbeat of change gets another interesting influence this lunar cycle: At the New Moon, Uranus is exactly conjunct the South Node of the Moon. With the South Node emphasis on karma, this could mean collectively that we need to account for rash actions of the past. Maybe, we will realize that war and violence aren’t the answers. Perhaps we can move toward a revolution that is sustainable and lasting if we break with past methods. The wild card in this lunar cycle is that Mercury is stationary and will turn retrograde tomorrow in Aquarius. Until February 11, when Mercury turns direct, all bets are off on things proceeding as we expect them to. This doesn’t mean disaster, but it does mean even more than usual for a Mercury retrograde, that we need to accept setbacks with a sense of humor and curiosity. What can we learn, right now, about our assumptions? Mercury is a bridge builder between polarities. A good intention for this airy lunar cycle could be to cultivate curiosity and open-mindedness. Mercury will bring us surprising insights if we do. Wednesday, January 21. Don’t say I didn’t warn you. Things will not go exactly the way you expected them to today. Is that so bad? It could be quite interesting! The detached observer quality of Aquarius could be delighted by the nature of mishaps that occur. Mercury stations retrograde today. When you go to www.ismercuryretrograde.com today, it will say, Yes. So it is. Mercury turns retrograde three times a year. Some stations are more upsetting than others. This one could be a little more charged due to the Moon’s contribution. One thing that Mercury retrograde encourages is to be more mindful. Since the Moon represents the unconscious, it a little harder to do that today. Slip-ups will happen. The best thing to do when frustrated is to breathe and return to the present moment. The Moon also contacts Venus in Aquarius and opposes Jupiter in Leo. Big things feel bigger. The upsets that happen in community may ultimately lead to better communication. Respect diverse points of view. January 23—Crescent Moon: Beginning. Can you believe it? We are already at the Crescent phase of this lunar cycle. After a few days of emotional release, now what do you want your intention of this lunar cycle to be? Don’t be afraid to embrace change of some kind. Your version doesn’t have to look like someone else’s but it is a good idea to let those winds of change blow a little more freely this month. It does no good to keep them bottled up. They will blow anyway. Aquarius, ruled by Uranus—the planet of awakening—is a sign that exhorts us to not go back to sleep. Life is wonderful. (And also tragic and hard.) Yet, this is the only life we have to live (at least for now), so wouldn’t it be better to live it more awake? The crescent Moon is always a lovely sight. Tonight at sunset, go out and look for the Moon with Mars right below it and Venus below Mars. See Earth and Sky for more information. Let these three, even if you can’t see them, exhort you to stay awake for this great adventure of change. The Moon in Pisces encourages reverie and inspires us to feel the wonder in being awake. Saturday, January 24. Carpe diem! With the Sun in Aquarius and the crescent Moon in Aries, I just couldn’t resist suggesting that you seize the day. The Moon’s contact with Saturn (fire Moon trine to fire Saturn) gives just enough structure to a day that feels expansive and hopeful. Sometimes fire is just the element needed to get us out of stuck cycles of behavior. This is one of those days where we get a new perspective and a reboot of energy. Use it well.